Early this afternoon there was a traffic jam on the motorway near the jungle. Many people went there to try and get into the lorries. 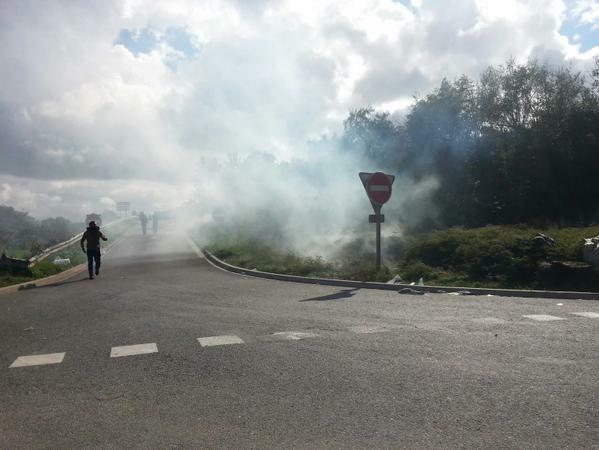 The police reacted by pushing them back in the jungle with use of batons and spray, and they fired tear gas on the jungle itself. 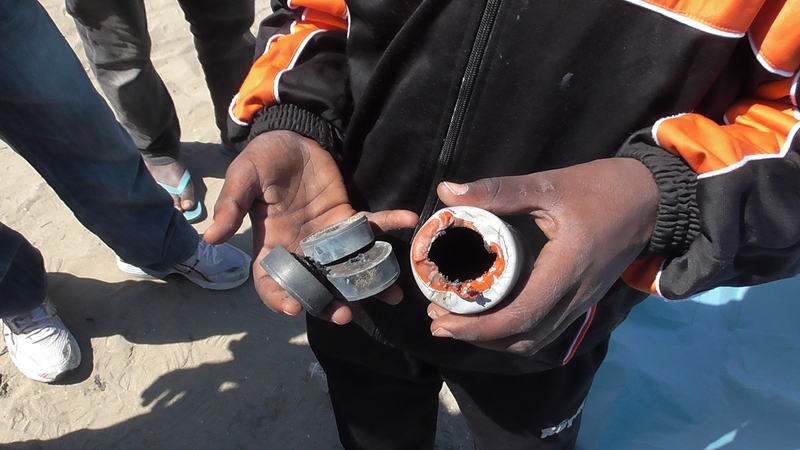 At least 10 salvos of tear gas were fired indiscriminately into jungle near the part of the camp where many Eritrean women live, there are also children in that part of the jungle. People fought back with stones. 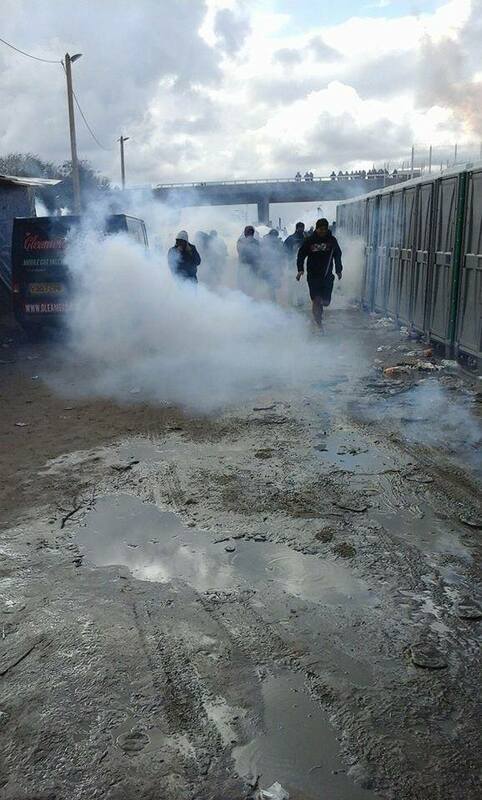 The police are using intense violence to push people back into the jungle and prevent people from exiting. 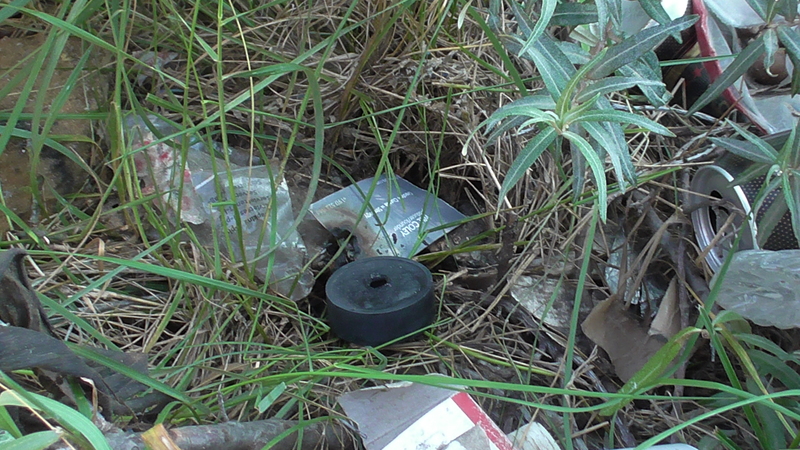 They also flew a drone over the jungle during the clashes to watch the people. 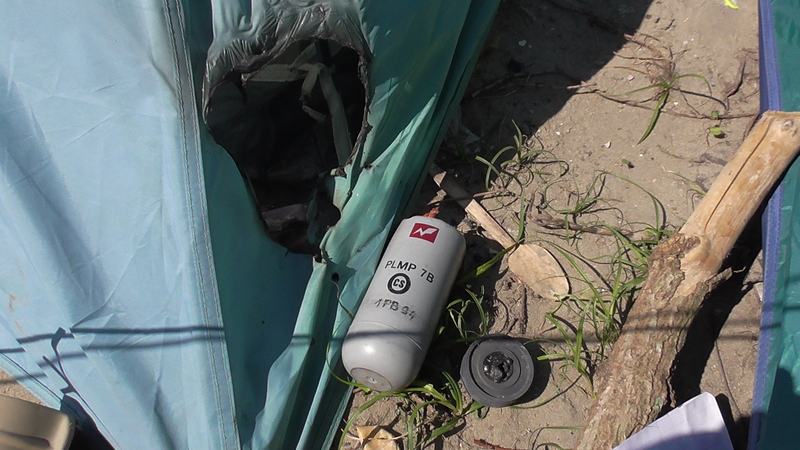 One person is currently in hospital also having been shot in the stomach with a rubber bullet. Video here. At 7:30 in the morning on July 29th there was a traffic jam on the A16 leading up to the port. This traffic jam backed up lorries all the way to where the major security fence along the road finishes right next to the migrant camp. One guy from the camp went up to the fence to see what was happening and was immediately sprayed by the CRS cops on the top of the hill. This action, in and of itself, was entirely disproportionate and shows that the police here treat the people as insects, but what they did next was entirely beyond reason and in no way related to stopping people from making it to the motorway. It was a sadistic attack with potentially deadly consequences. 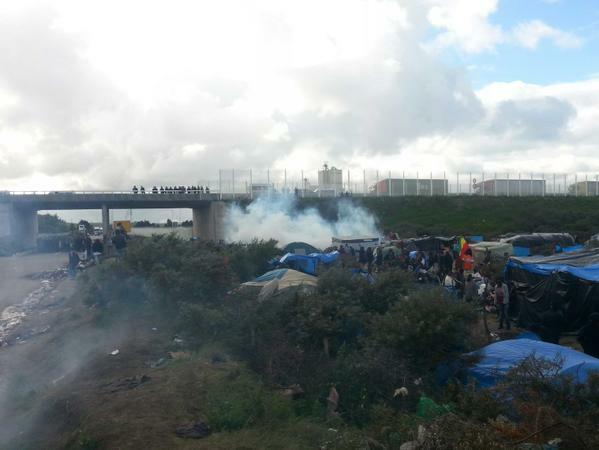 The people in the jungle below shouted and protested at the police’s action and the CRS retaliated by shooting two canisters of CS gas into the group of tents close to the motorway bridge where predominantly Eritrean and Ethiopian people are staying. The people in these tents were sleeping and were in no way trying to get to the motorway traffic jam. In addition to it being an entirely unprovoked attack on people who were asleep inside their homes, the police created an extremely dangerous situation for no justifiable reason. 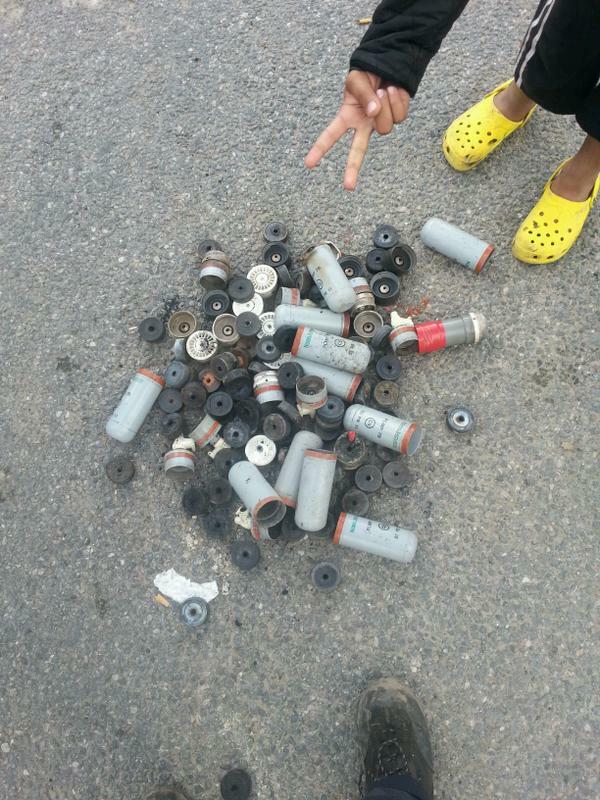 These canisters travel at high speeds dispersing incendiary disks, which release CS gas as they burn. 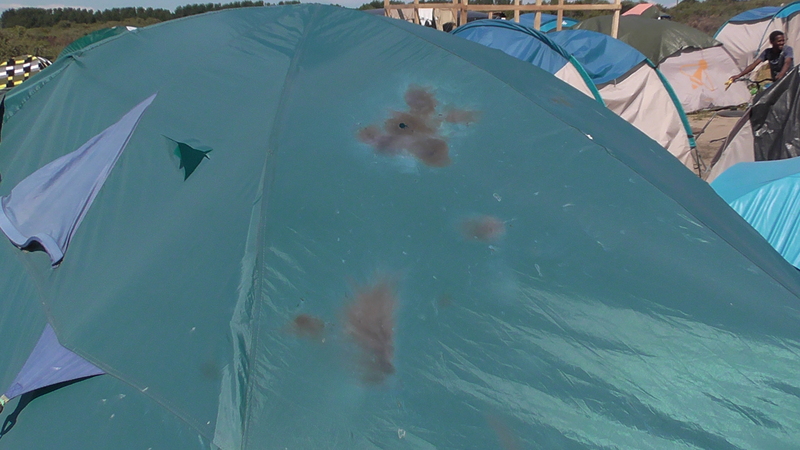 These disks melted holes in people’s tents and could have potentially started a huge fire, as well as spreading poison gas over an area of sleeping people. Then more vans of police fully decked out in riot gear arrived and violently forced people back to the camp, even though they only wanted to cross to go into the city center. 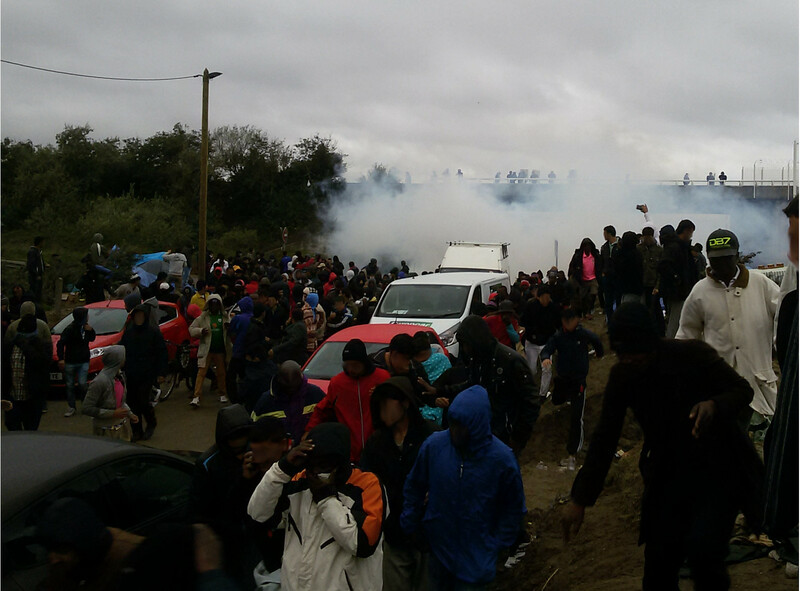 As the major media outlets continue to sensationalize the situation around the Eurotunnel and journalists build their careers on the misery of those living in the jungle, no one seems to care about the torture and violence that the state administers everyday. Video of the police taken from inside the jungle.